In 1983, a group of inspired Kalamazoo leaders took a leap of faith to create opportunities for low-income families to build and buy affordable homes in our community. They founded Kalamazoo Valley Habitat for Humanity (Habitat), now one of the oldest Habitat affiliates in the country and one of the largest affiliates in Michigan. 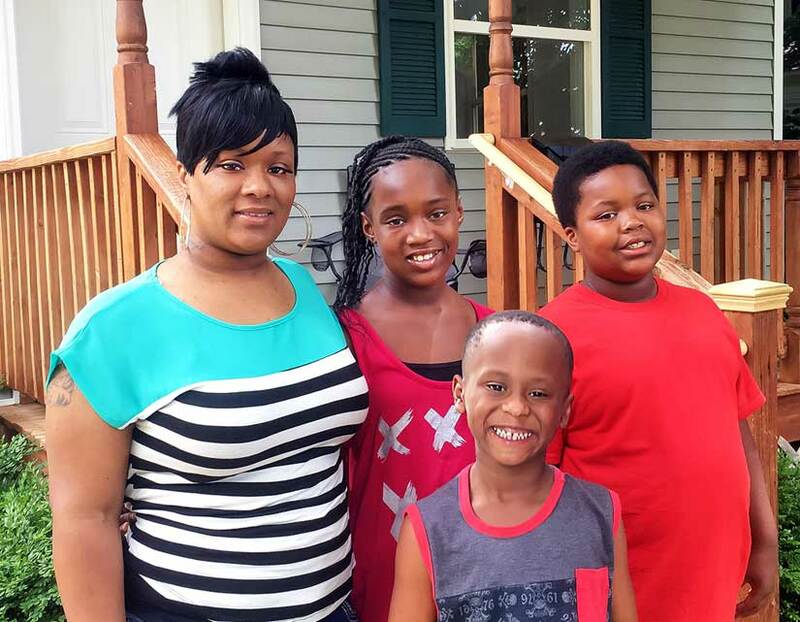 Thanks to our founders’ vision and the support of the community, more than 200 families have become Habitat homeowners. Building on our vision of a world where everyone deserves a decent place to live, Habitat launched a home repair program in 2014. Based on the core principles of our homeownership program, our repair program helps low-income homeowners who need an affordable option to preserve their homes. In a typical year, Habitat builds or rehabs and sells four homes and completes 12-16 critical home preservation projects. Our core commitment to affordable housing has not changed. We now embrace neighborhood revitalization — a holistic approach to end poverty housing by transforming communities through asset based community development practices. Neighborhood revitalization expands Habitat’s traditional partnerships with homeowners and volunteers to include neighbors and local organizations to create a far greater impact. Habitat is part of a growing, neighborhood collaboration with residents and businesses in Kalamazoo’s Eastside neighborhood. Habitat is fully committed to providing programs that help build a strong foundation for families and individuals working towards a more sustainable future. For thousands of hard-working, low-income families in Kalamazoo County and the southeast corner of Allegan County, homeownership is out of reach and affordable, good quality rental housing is hard to find. The statistics are grim: unsafe, unhealthy, inadequate housing is often the only option, and it is costly. Many families are forced to spend too much of their income on shelter, making other basic necessities unaffordable. Without Habitat’s affordable mortgages and no-profit homes, many families have zero opportunity for homeownership. Habitat also works to help existing low-income homeowners preserve their homes affordably. Habitat’s home repair program helps low-income homeowners preserve the integrity of their homes with no-profit repair services and affordable loans. The housing stock in our community is aging. For example, the city of Kalamazoo reports that 68% of residential units located in city neighborhoods was built before the 1970s. In the Eastside neighborhood, where Habitat is working as part of a neighborhood revitalization collaborative, 52% of homes were built before 1939. Many of the older homes are not energy efficient and are in different stages of disrepair. Current low-income homeowners report the unsafe conditions these homes present — mold issues, structural damage, and inaccessibility to those aging in their homes or with disabilities. With over 30% of their income going to housing costs, and often another 30% toward energy costs, the working poor and those living on fixed incomes are unable to maintain their homes — their primary assets. Kalamazoo Valley Habitat for Humanity meets the affordable housing crisis head on. We build and rehab houses. We repair and preserve homes. We provide affordable mortgages and repair loans. Habitat helps future homeowners and existing homeowners to acquire the strength, stability, and skills to face those responsibilities and challenges. Homeownership brings enhanced stability and opportunity to the lives of Habitat families. Habitat creatively explores strategies and makes connections that keep the cost of our homes and repairs—and homeownership—at a minimum. Why is homeownership so empowering? When a family owns an affordable, sound home, it builds financial equity and encourages self-esteem and self-reliance. Kalamazoo Valley Habitat for Humanity addresses affordable housing concerns with a truly revolutionary response. Because we understand both the great need and the far-reaching results that are possible, we are able to offer a program that brings true benefit to families. The entire community is lifted when families are able to build financial and social capital. Habitat makes it possible. Everything we need to address the housing crisis is right here in our community. The motivated families. The volunteers. The financial resources. Kalamazoo Valley Habitat for Humanity brings them all together to create a forceful chain reaction that improves many lives—for many years.